Sometimes the simple approach to a print is the best way to go, whether that is the composition of the subject or the subject itself. If you look at still life art prints, the subject matter is usually very simplistic like a bowl of fruit or floral arrangement. In composing the piece, the artist or photographer keeps the print clear of unrelated objects to allow the visual focus on the main subject. In taking this approach with other items, you can create art prints or photographs that have a very defined visual focus to tell a story. The manner in which the presentation is created can also help keep the focus on the subject or object you are presenting, by creating an overall mood or look. I have attached two samples to highlight what I’m referring to. 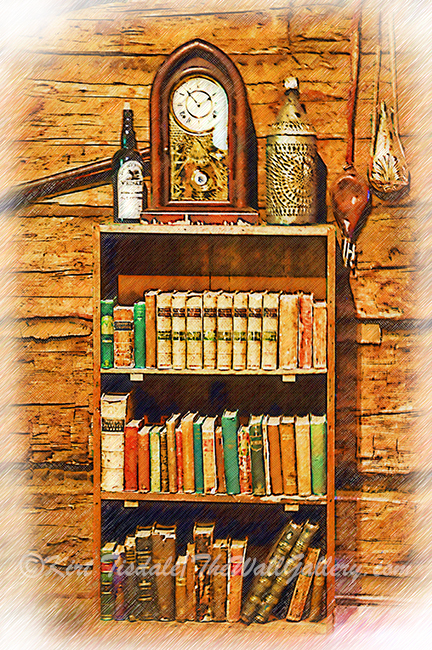 The first example is a bookcase located in a log cabin from the Sharlot Hall Museum in Prescott, Arizona. By it’s very nature there is a lot of objects in this print, but by keeping the composition of the presentation limited to the bookcase, you have simplified that aspect. To further tone down the variety of objects, I chose a sketching technique to soften the presentation. The overall result is a more simplistic presentation with a simple subject matter. The second attachment has less subject matter to begin with and the composition keeps the eye focused on this part of the log cabin. By having a suggestion of a window with a small desk and chair between that and a door, it creates a small intimate space where you can imagine someone working at the desk. The sketching technique softens the overall look, creating a simplistic warm and inviting visual effect. 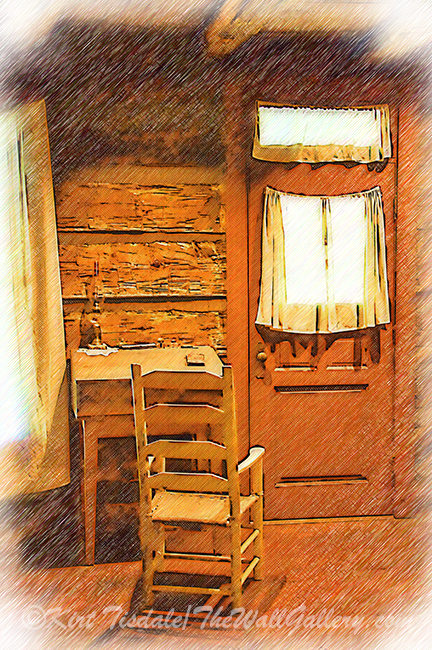 This entry was posted in Art Prints and tagged artist kirt tisdale, historic furnishings, interior design, log cabins, prescott arizona, sharlot hall museum, sketching on March 25, 2019 by Kirt D Tisdale. I have attached two sketched scenes I created from a trip we took a few years ago to Henry Island in the Pacific Northwest. We were staying with our daughter and her husband in Seattle and were headed to Henry Island where our son-in-law’s family had a couple of homes. To get to Henry Island, we took a ferry from Anacortes, Washington to Friday Harbor on San Juan Island. We then drove across the island to Roche Harbor where their was a family boat docked for the final leg of the journey over to Henry Island. 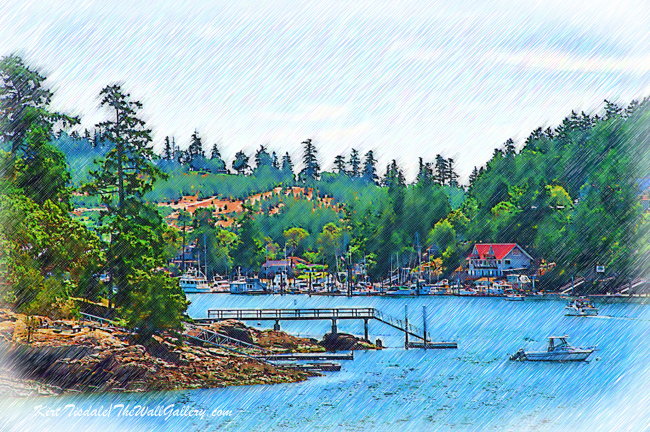 The first art print represents the scene I saw as we came into Friday Harbor, which is on San Juan Island. 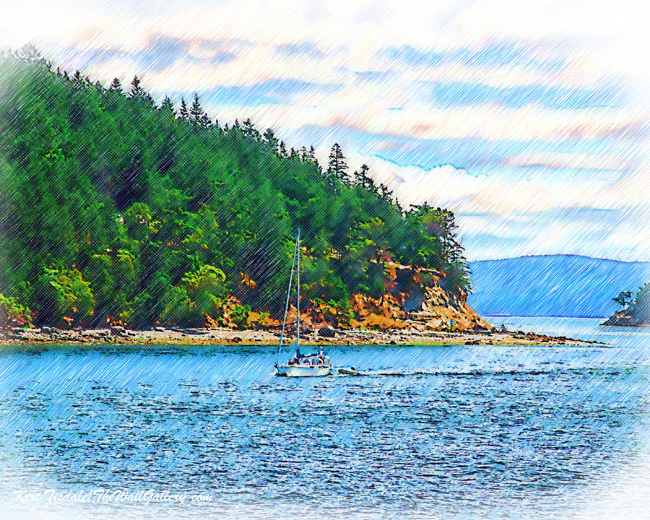 The second art print was a sailboat I saw as we headed back going by Lopez island. It was a beautiful day for sailing. 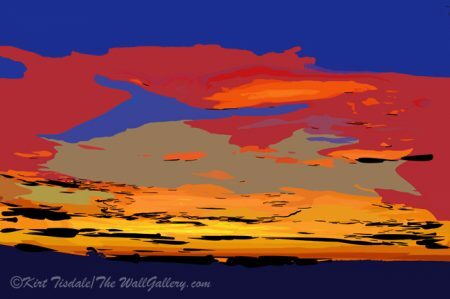 This entry was posted in Art Prints and tagged artist kirt tisdale, friday harbor, interior design, islands, landscapes, online art gallery, pacific northwest, sailing, sketching on February 4, 2019 by Kirt D Tisdale. 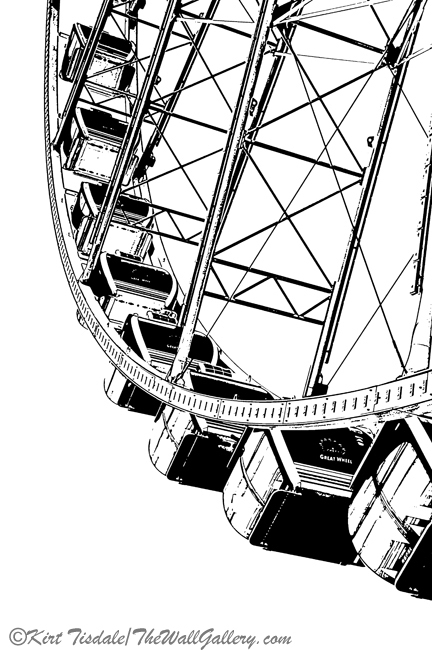 Always looking for an interesting aspect or angle to a subject matter, I have attached two prints I created of The Seattle Great Wheel. The official website to the Seattle Great Wheel is here (the website has a great overall picture of the ferris wheel at the end of pier 57 along the bay front of downtown Seattle). It really is an impressive ferris wheel and has fast become one of the main attractions in downtown Seattle. I did a photo shoot a few years back and spent quite awhile trying to capture unique shots of this very large ferris wheel. I wanted something a little different to highlight the architectural detail of this beautiful wheel. As I went through the shots and started narrowing it down to unique angles, I thought that with the geometric simplicity of the structure, why not try some of these angles in a sketching or ink pen style…both simplistic in visual appearance and focusing specifically on the structure. With the help of Adobe Photoshop I came up with these prints that portray two very different angles and perspectives of the gondolas as they went around the large wheel. 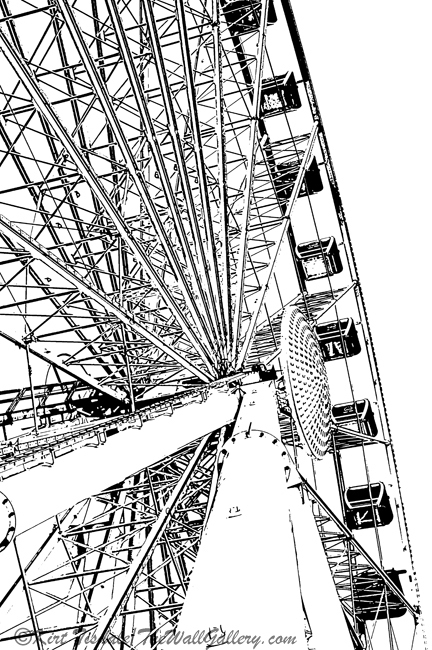 This entry was posted in Art Prints and tagged architecture elements, artist kirt tisdale, drawing, ferris wheel, interior design, online art gallery, seattle great wheel, sketching on July 13, 2018 by Kirt D Tisdale. Anyone that has been following my work, knows I have an affinity to black and white photography. As I have stated before, I began serious photography with black and white film and had access to a dark room to develop my own prints. The mood, contrast and elements that become center stage in a photograph is different when seen in black and white versus the same shot in color. With these prints I have taken that look one step further with a pencil sketching technique. Using a sketched look versus the original photograph gives the final print a softer more rustic feel. 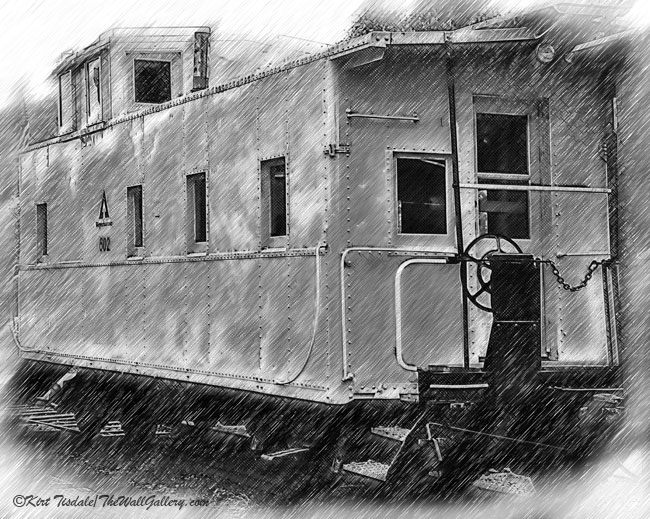 For this post I chose two sketches I created from the Issaquah Train Station (now a museum in Issaquah, Washington). 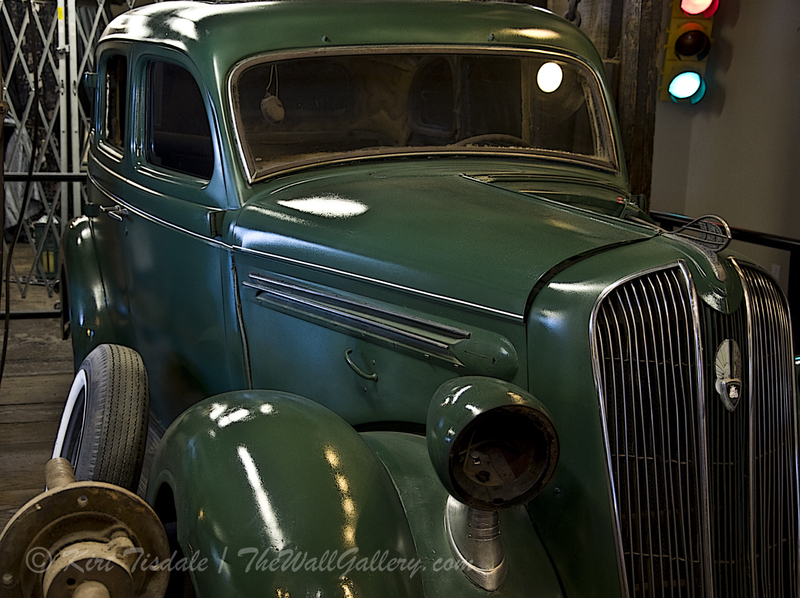 I have featured numerous prints from this location as it lent itself to so many opportunities. I love these old baggage carts sitting on the platform. 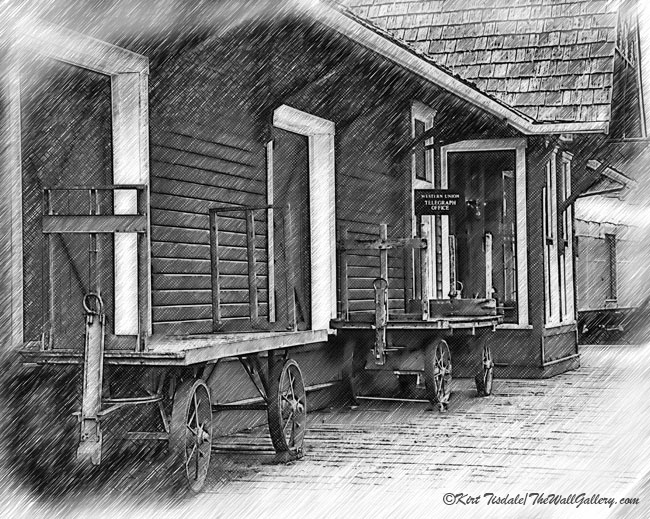 This entry was posted in Art Prints and tagged artist kirt tisdale, black and white sketches, interior design, Issaquah Railroad Station Museum, issaquah washington, online art gallery, sketching, train station on April 13, 2018 by Kirt D Tisdale. 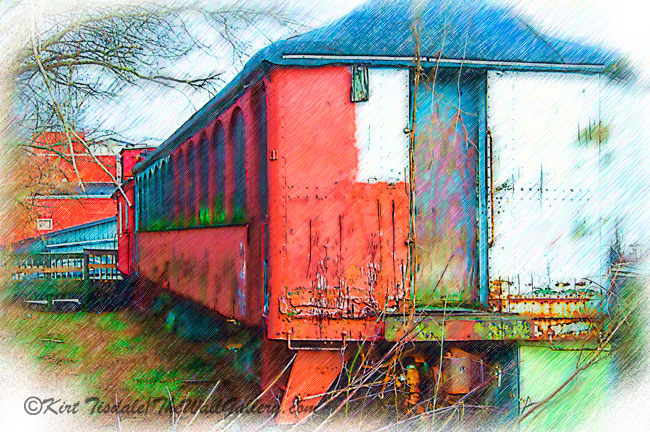 The Red Railroad Car – is a wall art print I created using a colored pencil sketching technique to create this look. This technique uses strong, but narrow diagonal lines with bright colors. The setting is an old train car located along a path in Rockford, Michigan. The train looks like it might have been used as a diner at some point, but now sits abandoned. Thoughts? 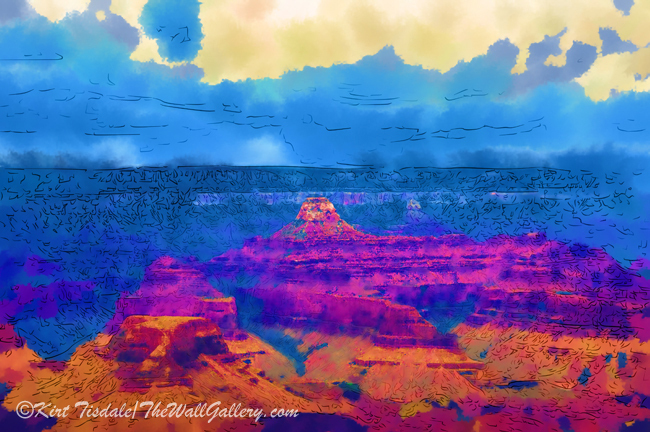 This entry was posted in Art Prints and tagged artist kirt tisdale, interior design, michigan, online art gallery, sketching, train, watercolor on September 25, 2016 by Kirt D Tisdale. 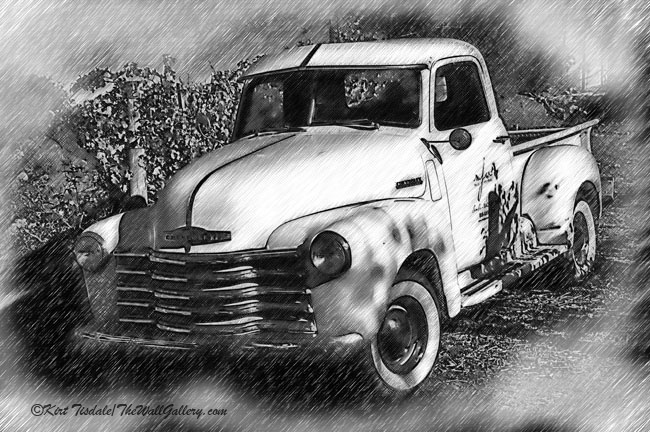 This entry was posted in Art Prints, Black and White Photography and tagged artist kirt tisdale, chevy, classic cars, classic trucks, interior design, online art gallery, sketching on June 22, 2016 by Kirt D Tisdale. 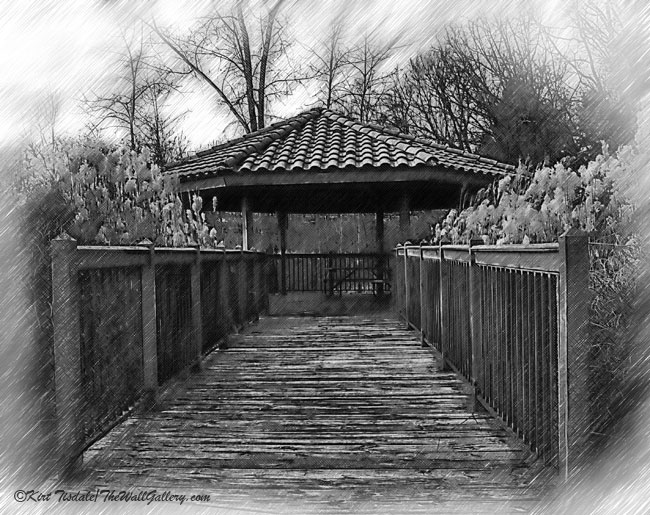 This entry was posted in Art Prints and tagged artist kirt tisdale, interior design, michigan, online art gallery, park, pavilion, river, sketching on June 17, 2016 by Kirt D Tisdale.